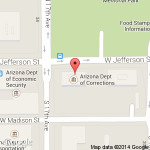 Change and adaptation best characterize the history of the Arizona Board of Executive Clemency. The State of Arizona first afforded inmates the opportunity for parole in 1901. The Board of Control functioned as the state's discretionary releasing mechanism and consisted of the Governor, Territorial Auditor, and one citizen appointed by the Governor. The Board of Control retained its releasing authority until the first criminal code became effective in October of 1913. In 1913, the Legislature established the Board of Pardons and Paroles, which assumed the discretionary releasing function of its predecessor, the Board of Control. Board membership consisted of a citizen appointed by the Governor to serve as Board chairperson, the Superintendent of Public Instruction, and the Attorney General. Board composition remained unchanged for the next five decades. The Legislature expanded Board membership to five part time members in 1966 and the Governor appointed all members to five year terms. In 1968, the Legislature amended this expansion and created a Board comprised of three full time members. The Governor appointed all members to three year terms and the appointments became subject to Senate confirmation. A full decade passed before the Board experienced another change in its composition. In 1978, the Legislature increased the Board size to five full members. The appointments were to five-year terms and remained subject to Senate confirmation. The legislative action coincided with the passage of the new Criminal Code. Then, in 1984, the Legislature expanded Board membership to seven full-time members in 1984. However, 1993 brought more change when the Legislation passed new sentencing guidelines which is referred to as “truth in sentencing” or TIS. Along with “truth in sentencing,” came the abolishment of parole for inmates whose offense was committed on or after January 01, 1994. This brought about a change in the Board’s name from Board of Pardons and Paroles to its current name of the Board of Executive Clemency. In 1997, the Board’s membership was reestablished as five members which became effective in 1998. In 2009, budget reductions limited the five members to a 32 hour work week and eliminated employee benefits. In 2013, an increasing workload expanded the work week to 40 hours but still eliminated benefits. In 2017, Governor Doug Ducey recognized the work of the Board and signed Senate Bill 1070 granting full employee benefits to the members. Today, the Board works a full time schedule conducting hearings Monday through Thursday.